You recommended this product to replace our previous Showerforce Victorian T. The manual of the product says that it can work under low pressure. WE have a water tank about 2m above the valve. However, after it was installed, there was no hot water coming out. Very pleased with the valve, have searched for two weeks for a valve that would have pipe centres of 138/145 this unit is adjustable 130/160. Without this valve I would have ended up retiling and repiping to suit an unsuitable larger valve Excellent little valve! Thanks, Ian Cameron . So far my plumber and I are very satisfied with the product although he did think it was a little expensive. This item is genius! It allowed me to update the bathroom without disturbing any of the existing tile work. It looks clean,simplistic and modern. Very pleased with it, needed a unit to replace my old one which had 140 cm pipe centres. This has adjustable pipe centres so was easily fitted. 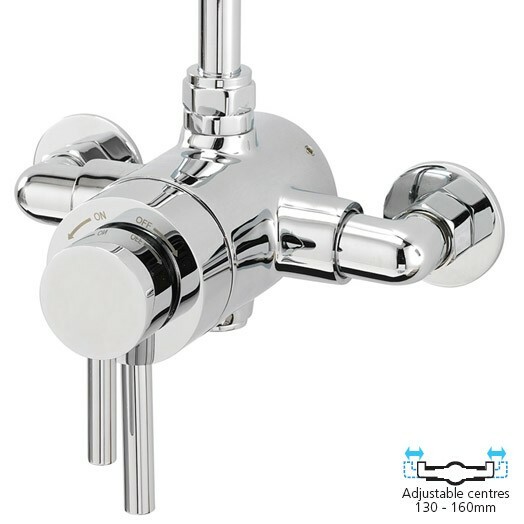 the product is of a good quality and was easy to fit to existing pipework. Seems well made, works well.. Seems to work as described. Easy to turn on/off and control temperature. Able to match existing pipe spacing with adjustable inlets.